Se ha descubierto el más antiguo retrato conocido de una mujer maya tallado en piedra. El hallazgo demuestra que las mujeres ostentaron posiciones de autoridad en épocas muy tempranas de la historia maya, como reinas o deidades. El descubrimiento fue hecho por una arqueóloga de la Universidad de Calgary y su equipo internacional de investigadores en Guatemala, concretamente en el yacimiento arqueológico de Naachtun, una ciudad maya localizada a unos 90 kilómetros al norte, y a través de una densa selva, de la ciudad maya más famosa: Tikal. La cara de la mujer, tallada en un tipo de monumento de piedra denominado estela, y en un estilo artístico nunca antes visto, sugiere que las mujeres desempeñaron papeles significativos en la política maya más arcaica. La mujer podría ser una figura de la historia maya, pero los investigadores se encuentran tentados de creer que podría tratarse de una figura mítica. Las inscripciones jeroglíficas del período Clásico Tardío (600-900 dC) mencionan a deidades femeninas, pero ninguna ha sido descubierta en una estela. "Si ésta es una deidad, entonces es sumamente rara", afirma Reese-Taylor. "Cuando los textos jeroglíficos mencionan a las mujeres, normalmente sucede por ser la madre o la esposa de alguien". La estela mide dos metros de alto, un metro de ancho y 50 centímetros de espesor. Fue enterrada por los mayas dentro de un antiguo edificio, después de que su ciudad fue atacada y las inscripciones en la estela borradas por las fuerzas invasoras. El entierro fue un acto reverencial con el objetivo de honrar a la personalidad cuya imagen se talló en el monumento. El entierro de un niño acompañó a la estela. La Dra. Julia Guernsey, profesora de Historia del Arte Precolombino de la Universidad de Texas en Austin, dice que el género femenino de la figura retratada en la estela es indiscutiblemente significativo. De hecho, si este personaje fue una mujer histórica, ello implica que su retrato precede en más de cien años a otras representaciones conocidas en estelas de mujeres poderosas de las Tierras Bajas Clásicas Mayas. También significa que existe la necesidad de reevaluar el papel y el estatus de las mujeres dentro de la dinámica política de la época clásica temprana de los mayas. Otros codirectores del proyecto son el Lic. Guillermo Martín Rangel, de la Universidad de San Carlos, Guatemala; el Dr. Peter L. Mathews, de la Universidad de La Trobe, Australia; y la Dra. Debra Selsor Walker, de la Universidad Internacional de Florida. A University of Calgary archaeologist and her international team of researchers have discovered the earliest known portrait of a woman that the Maya carved into stone, demonstrating that women held positions of authority very early in Maya history – either as queens or patron deities. The discovery was made earlier this year in Guatemala at the site of Naachtun, a Maya city located some 90 kilometres through dense jungle north of the more famous Maya city of Tikal. The woman"s face, carved on a stone monument called a stela [STEE-la] – and in an artistic style never before seen – suggests women played significant roles in early Maya politics. "I"ve worked in the Maya area a long time and I"ve never seen anything like it," says Dr. Kathryn Reese-Taylor, the director of the U of C-led Naachtun project. "We have images of queens, who ruled both singly and with their husbands or sons, depicted on stelae later in Maya history beginning in the early 6th century AD. But this stela is completely unique in style and likely dates to the 4th century AD." The woman could be a figure from Maya history, but researchers are tantalized by the possibility she might be a mythical figure. Hieroglyphic inscriptions of the Late Classic period (600-900 AD) mention female deities, but none have ever been discovered on a stela. "If this is a patron deity, then it is extremely rare," Reese-Taylor says. "When hieroglyphic texts do mention women, it is usually in the context of being either someone"s mother or someone"s wife." The stela measures two metres in height, one metre in width, and 50 centimetres in depth. It was buried by the Maya inside an ancient building after their city was attacked and the inscriptions on the stela were hacked off by the invading forces. The burial was a reverential act meant to honour the individual whose image was carved on the monument. An infant"s burial accompanied the stela. Students from a number of universities participated in the project in 2005: Alejandra Alonso, a Ph.D. student from the University of Calgary, assisted Lic. Martin Rangel with the excavation of the stela. Ms. Alonso is also a conservator, so her expertise was invaluable for the subsequent conservation of the monument. Shawn Morton, a U of C MA student, is surveying and mapping Naachtun"s civic centre, which extends over two square kilometres. For more information, see: www.ucalgary.ca/~naachtun/. Print quality pictures and two 30-second Quicktime video clips (320 x 240) are available at: http://www.ucalgary.ca/news/dec05/naachtun/pics/index.html. Dr. Reese-Taylor can be reached at (403) 220-6369, or by arrangement through Greg Harris, Media Relations, (403) 220-3506, or cell (403) 540-7306. The Naachtun Archeological Project is a multi-disciplinary research project that merges archaeological investigations with environmental conservation and economic development in the tropical forest of northern Guatemala. The ancient Maya city of Naachtun is still one of the most remote sites in the Yucatan peninsula, and one of the least known of all major Classic Maya centres. The site was re-discovered in 1922 by Sylvanus Morley, who named it Naachtun,"Distant Stone" because of its inaccessibility. Sadly, however, even though Naachtun is extremely isolated, most of the major mounds have been pitted and trenched by looters. The Naachtun Archaeological Project, which commenced in 2002, is undertaking the first scientific excavations of the site. Although presently considered a very remote place, during the Late Pre-Classic (400 BC - AD 150) and Classic Maya period (AD 150 - 900), Naachtun was very much in the thick of things. Naachtun lies on the northeastern edge of the Mirador Basin, a broad area approximately 40 km. in diameter, where the earliest development of complex society in the Maya area took place. Many of the great cities in the Mirador Basin did not survive the end of the Preclassic period; Naachtun was one of the few, apparently, that did. This transition from the Late Preclassic to the Classic period equals in complexity the Maya "collapse", yet its causes and immediate aftermath remain elusive. Because if its successful navigation through this transition period, Naachtun is the key to understanding the changes that took place during the Preclassic-to-Classic shift. But Naachtun did more than merely survive these tumultuous events, apparently it thrived. The Early Classic period (AD 150-600) was one of exponential growth at Naachtun. Indeed, the size of the Classic period city, the grandeur of its temples and palaces, and the presence of over 26 carved stelae indicate that Naachtun grew to be the centre of a powerful kingdom. The presence of an "Emblem Glyph", which includes the ancient name of the kingdom and the identification of it "Divine Lord", would provide direct evidence for this. However, lacking this important piece of information, Naachtun remains an anonymous participant in the political developments of the Classic period. However, the actions of Naachtun's rulers must have been a significant factor in the political ploys of other Maya kings, as the ancient kingdom lay directly between Tikal and Calakmul, the two greatest cities in the ancient Maya world. Considered the two "superpowers" of the Classic Maya, Calakmul and Tikal formed large confederacies and fought major wars, both directly against each other and "by proxy". Situated between these two formidable kingdoms, Naachtun held not only a strategic position, but also a vulnerable one in an environement of endemic warfare. The control of Naachtun must have been seen as a necessary prologue to any concerted attempt by the kings of Tikal and Calakmul to launch an attack against the other. Yet, despite the incessant strife, Naachtun continued to thrive as the capital of a powerful city-state until its demise in circa 830. Because of its strategic location and long history, Naachtun is one of the most important and least known sites in the Maya area. In order to shed light on this significant, yet enigmatic kingdom, the Naachtun Archaeological Project, a multi-year, multi-disciplinary program of research, was launched in 2002. The Naachtun Archaeological Project merges archaeological investigations with environmental conservation and economic development in the tropical forest of northern Guatemala. Archaeological development of the Classic Maya site of Naachtun can contribute directly to the preservation of Naachtun-Dos Lagunas Biosphere as a pristine rainforest environment. In addition, the on-going research and development of Naachtun will provide a foundation for sustainable ecotourism in the area. Why did Naachtun survive the cultural and political collapse which occurred at the end of the Late Preclassic (100 BC-AD 150), when most of its nearest neighbours did not? What was the basis for Naachtun's subsequent growth during the Early Classic (AD 150-600)? Was Naachtun implicated in the warfare that was virulent during the Late and Terminal Classic periods (AD 600-900)? Because of its position at the nexus of three distinct culture areas, did Naachtun serve as a cultural or economic crossroads? What caused the abandonment of this once-great city? The initial season of investigations at Naachtun revealed that the civic center was founded between 100 BC and AD 150, however, its period of greatest growth appears to have been between AD 150 and 300, the initial stages of the Early Classic period. During this period, most of Group A was constructed, as well as a large 15 m tall structure (La Perdida) situated between Group A and C. In addition, Structures I and V in Group C underwent large scale modifications during this period. Finally, the presence of looted tombs, stelae, and large elaborate buildings in Groups A and C point to the development of a successful, independent polity during this period. Our second season of investigations focused on this early period of growth. We were specifically interested in addressing questions regarding the foundation of the city-state in this region and the role that warfare played in the Naachtun's fortunes during the Early Classic. The site of Naachtun lies at the heart of the largest continuous tropical forest canopy in Peten, Guatemala. Situated within the Naachtun-Dos Lagunas Biosphere, the ruins of Naachtun are located just one kilometer south of the Mexican border. The mature tropical canopy sheltering the site is pristine, having been uninhabited for nearly a millennium. The majestic trees that cover the ruins are also home to a myriad of vulnerable rainforest species. Many of these species are on the endangered list, such as the jaguar and Mantled Howler and spider monkeys. In Guatemala alone, 50 to 75 percent of the rainforest has been clear-cut or burned in the last 15 years. Those animals not killed outright are left with no natural habitat. Conservation of the cultural resources insures the continued preservation of large tracts of natural tropical forest habitat. In the center of a swath of protected rainforest that stretches across the northern limits of Guatemala, the Naachtun-Dos Lagunas Biosphere is on the front lines of an effort to secure and stabilize existing forest for sustainable economic development through tourism. Tropical rainforest areas of the Peten, today, are under substantial pressure, both from local population growth and invaders coming in from Mexico. Naachtun, as the major archaeological site in this area, is pivotal to all strategic plans for conservation and development in the northern Peten. Therefore, the Naachtun Archaeological Project is working the Guatemalan government, NGOs, and local communities to conserve the natural and cultural resources in the region. Mathews, Peter, Kathryn Reese-Taylor, Marcelo Zamora, and Alexander Parmington. 2005 Los Monumentos de Naachtun, Peten.In XVIII Simposio de Investigaciones Arqueológicas en Guatemala, 2004, edited by Juan Pedro LaPorte, Bárbara Arroyo, and Héctor E. Mejía, pp. 691-696. Ministerio de Cultura y Deportes, Instituto de Antropología e Historia, Asociacíon Tikal, and Foundation for the Advancement of Mesoamerican Studies, Inc, Guatemala City. Reese-Taylor, Kathryn, Peter Mathews, Marcelo Zamora Mejía, Debra Walker, Martin Rangel, Silvia Alvarado, Ernesto Arredondo, Shawn Morton, Alex Parmington, Roberta Parry, Baudilio Salazar, and Jeff Seibert. 2005 Proyecto Arqueológico Naachtun: Resultados Preliminares de la Primera Temporada de Campo 2004. In XVIII Simposio de Investigaciones Arqueológicas en Guatemala, 2004, edited by Juan Pedro LaPorte, Bárbara Arroyo, and Héctor E. Mejía, pp. 91-100. Ministerio de Cultura y Deportes, Instituto de Antropología e Historia, Asociacíon Tikal, and Foundation for the Advancement of Mesoamerican Studies, Inc, Guatemala City. 2004 Exploring Naachtun. Institute of Maya Studies Newsletter, Vol. 33:11, pp. 1,5-6. Miami Musuem of Science, Miami. Reese-Taylor, Kathryn, Marc Zender and Ernesto Arredondo. 2002 The 2002 Naachtun Reconnaissance Report. Report submitted to the Instituto Nacional de Antropología e Historia, Guatemala City, Guatemala. Reese-Taylor, Kathryn, Peter Mathews, Julia Guernsey, and Marlene Fritzler. 2005 "Warrior Queens Among the Classic Maya." Paper presented at the 70th Annual Meeting of the Society for American Archaeology, March 30-April 3, Salt Lake City, UT. and at the 2004 Chacmool Conference: Que(e)rying Archaeology, the 15th Anniversary Gender Conference, November 11-14, Calgary, AB. Reese-Taylor, Kathryn, Martin Rangel, Debra Selsor Walker, David Stuart, Peter Mathews, Alejandra Alonso, Silvia Alvarado, Ernesto Arredondo, Chris Morehart, Shawn Morton, and Fernando Rochaix. 2005 "Resultados de Investigaciones en 2005: el Período Clásico Temprano de Naachtun." Paper to be presented at the XIX Simposio de Investigaciones Arqueológicas en Guatemala, July 18-22, Guatemala City. Walker, Debra Selsor, Kathryn Reese-Taylor, and Peter Mathews. 2005 "Después del la Caída: El Despertar del Período Clásico." Paper to be presented at the XIX Simposio de Investigaciones Arqueológicas en Guatemala, July 18-22, Guatemala City. Mathews, Peter, Kathryn Reese-Taylor, Marcelo Zamora Mejía, and Alexander Parmington. 2004 "Historia de las investigaciones epigráficas en Naachtun." Paper presented at the XVIII Simposio de Investigaciones Arqueológicas en Guatemala, July 15-19, Guatemala City. Reese-Taylor, Kathryn, Peter Mathews, Marcelo Zamora Mejía, Silvia Alvarado, Ernesto Arredondo, Shawn Morton, Jason Parmington, Roberta Parry, Martin Rangel, Baudilio Salazar, and Jeff Seibert. 2004 "Proyecto Arqueológico Naachtun: Resultados Preliminares de la Primera Temporada de Campo 2004." Paper presented at the XVIII Simposio de Investigaciones Arqueológicas en Guatemala, July 15-19, Guatemala City. Reese-Taylor, Kathryn, Peter Mathews, Ernesto Arredondo Leiva, and Marc Zender. 2003 "Naachtun: Un Cuidad Clasico de los Mayas." Paper presented at the XVII Simposio de Investigaciones Arqueológicas en Guatemala, July 21-25, Guatemala City. Reese-Taylor, Kathryn, Peter Mathews, Marc Zender, and Ernesto Arredondo Leiva. The Maya. Seventh edition. (2005) Michael Coe. Thames and Hudson. Chronicle of Maya Kings and Queens. (2000) Simon Martin and Nikolai Grube. Thames and Husdon. Breaking the Maya Code. Revised edition. (1999) Michael D. Coe. Thames and Hudson. Code of Kings. (1999) Linda Schele and Peter Mathews. Scribner. Popol Vuh. (1996) Dennis Tedlock. Touchstone. Maya Cosmos. (1995) David Freidel and Linda Schele. Harper Paperbacks. The Ancient Maya. Fifth edition. (1994) Robert Sharer. Stanford University Press. Maya Civilization. (1993) T. Patrick Culbert. Smithsonian Institution Press. Forst of Kings. (1992) Linda Schele and David Freidel. Harper Perennial. Blood of Kings. Reprint edition. (1992) Linda Schele and Mary Miller. George Braziller. FAMSI, The Foundation for the Advancement of Mesoamerican Studies, Inc. However, another building at Naachtun (Structure XXXIX on the map) is built in yet another style - constructed with cut-stone masonry that is characteristic of Río Bec architecture. This is a widespread architectural style that is found across the region to the north of Naachtun. This array of architectural influences, probably reflecting the site's shifting political affiliations and regional connections, makes Naachtun one of the most interesting of all Classic Maya sites for study. Naachtun was rediscovered by the archaeologist Sylvanus Morley, of the Carnegie Institution of Washington, on 3 May 1922. Morley had heard of the site from a chiclero - a person who collects sap, used for making chewing gum, from chicle trees - named Alfonso Ovando, who first saw the site in 1916. Morley and a Filipino photographer, Juan Sopeña, subsequently spent a total of seven days at the site, where they investigated many of the standing buildings and discovered 19 of Naachtun's 40+ stelae. In the mid 1970s, Eric von Euw, of the Corpus of Maya Hieroglyphic Inscriptions project at Harvard University, visited the site for a few days and made field drawings of several stelae. And in the 1990s, Nikolai Grube, of the University of Texas at Austin, also visited Naachtun, and recorded the inscriptions on several stelae. While von Euw illustrated many of the previously unknown stelae at the site, Grube discovered the ancient name of the Naachtun kingdom on Stela 1. According to Grube, the Classic period Maya of Naachtun called their kingdom Masuul. The size of Naachtun, the grandeur of its public architecture, and the presence of over 40 stelae, indicate that it was the centre of a very powerful kingdom during the Classic period. 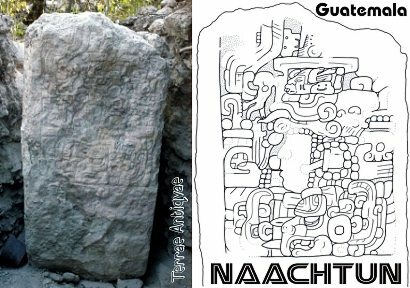 Yet the name of the kingdom, as recorded in hieroglyphic texts, remained a mystery until the mid 1990s, when the epigrapher Nikolai Grube discovered the ancient Mayan name of Naachtun. The earliest dated reference to the Masuul kingdom is found on Tikal Stela 10. Dating to 486, the passage states that the capital of the Masuul kingdom (ie Naachtun) was conquered by Tikal. The defeated king was brought before the Tikal king 'seven days later' and may well be the captive shown on the front of Stela 10. A familial relationship with Tikal is also suggested by texts and images on Naachtun Stela 9, dating to 731. This stela depicts a lady of Tikal at Naachtun, probably the wife of a local ruler, and suggests that the political and familial alliance of Naachtun and Tikal continued until at least this period. Late Classic existence was a precarious one politically, alternating in affiliation between Calakmul to the north and Tikal to the south - another indication that, throughout its history, the city played the role of 'piggy in the middle' between two superpower neighbours. Finally, there is a particularly distinctive architectural feature at Naachtun that betrays the political turmoil of the Classic period. The map indicates that Structures VII-XII are surrounded by a wall, and in the 2002 reconnaissance of the site it was confirmed that this feature is indeed a wall. It was also evident that the wall was added some time after Structures VII-XII were built, and that it is reminiscent of defensive walls found at the sites of Dos Pilas and La Joyanca to the south.